The dispersants, scientists have found, may have significantly reduced the amount of harmful gases in the air at the sea surface — diminishing health risks for emergency responders and enabling them to keep working to stop the spill and clean it up sooner. The results were published today in the journal Proceedings of the National Academy of Sciences. The research team included Jonas Gros, Scott Socolofsky, Anusha Dissanayake and Inok Jun of Texas A&M University; Lin Zhao and Michel Boufadel of the New Jersey Institute of Technology; Christopher Reddy of the Woods Hole Oceanographic Institution; and J. Samuel Arey of the Swiss Federal Institute of Aquatic Science and Technology. The study was funded by the Gulf of Mexico Research Initiative and the National Science Foundation (NSF). "In 2010, when NSF began rapid response funding for research on Deepwater Horizon, it was important to characterize the initial conditions of the spill such as plume dynamics and ecological effects," says Don Rice, a program director in NSF's Division of Ocean Sciences, which supported the new research. "These scientists and others did just that. As the findings of this study clearly demonstrate, the discoveries of basic scientific research and the practical applications that follow in their wake are often unanticipated." In the midst of the Deepwater Horizon crisis, officials made the decision to, over 67 days, inject more than 700,000 gallons of chemical dispersant above the oil rig's severed wellhead at the bottom of the gulf. The aim was to break the petroleum into smaller droplets in the deep sea to diminish oil slicks and reduce the amount of harmful gases rising to the ocean surface. The new study demonstrates a beneficial effect of the dispersants: The subsea dispersant injection may have allowed emergency responders to literally breathe easier. By breaking petroleum into smaller droplets that dissolved faster in the deep ocean, the dispersants decreased the amounts of volatile toxic compounds that rose to the surface and into the air. This process improved air quality for the responders and likely reduced the number of days when responders were forced to don respirators or suspend cleanup efforts. Dispersants have been applied to oil slicks on the ocean surface for half a century to break petroleum into smaller droplets that dissipate and to keep oil from reaching ecologically sensitive coastlines. But they had never been used at the unprecedented depth of 5,000 feet beneath the surface, where an estimated 7,500 tons per day of oil and 2,400 tons per day of natural gas were jetting from the ruptured wellhead. That flow rate is equivalent to 57,000 barrels per day of oil and 92 million cubic feet per day of gas at the sea surface. During the period studied, an inverted funnel, or "top hat," that was placed directly above the wellhead prevented 19,000 barrels per day of oil from escaping into the sea. In the new study, the scientists built and tested a mathematical model that simulated the complex chemical and physical interactions among water, oil, gas and dispersant during Deepwater Horizon. The researchers focused on the period starting June 3, 2010, when engineers cut the riser pipe at the wellhead, through July 15, 2010, a timespan when a large number of scientific observations were collected nearby in the air and ocean. To test the model's ability to simulate the real-world disaster, the scientists compared its predictions to these observations. Nearly all the comparisons aligned with the model's output, indicating that the model replicated many aspects of what happened to the oil and gas under the ocean surface. The team then ran the model to see what would have happened if dispersants had not been injected above the wellhead during the same time period. The results indicated the deep-sea dispersant injection did have a profound effect on air quality at the ocean surface. The injection of the subsea dispersant caused the turbulent jet of petroleum fluids to form oil droplets that were about 30 times smaller by volume than they would have been without dispersants. 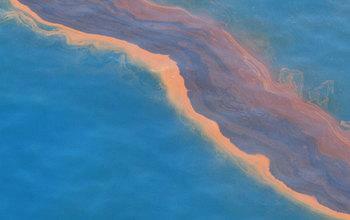 This subtle change caused many volatile petroleum chemicals to dissolve more rapidly. Most of the highly toxic benzene and toluene in the oil were transported away in deep currents and likely would have biodegraded within weeks, say the scientists. The dispersant injection, according to the model, decreased the overall concentration of all volatile organic chemicals in the atmosphere by a modest amount, about 30 percent. But it also significantly reduced the amount of chemicals most harmful to humans, such as benzene and toluene. The atmospheric concentration of benzene, for example, decreased by about 6,000 times, dramatically improving air quality. Without the dispersant injection, the model showed that benzene concentrations in the air 2 meters above the sea surface would have been 13 times higher than the levels considered acceptable to breathe during a 10-hour working day or a 40-hour work week, based on guidelines by the National Institute of Occupational Safety and Health. However, with the dispersant injection, the model showed that atmospheric benzene concentrations were 500 times lower than the levels considered acceptable to breathe. The researchers believe that clean-up delays would have been more frequent if the subsurface dispersant injection had not been applied.